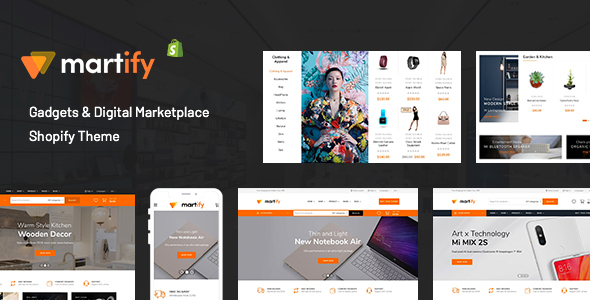 Martify is a feature-rich premium Gadgets & Digital Marketplace Shopify Theme with modern design and bundled with powerful features for creating an online store and start selling. Included in the theme are some pre-made demos for any kind of website, get them with 1 Click Demo Importer, this list is updated frequently. and more to come in the upcoming updates! No reason to worry about the growing mobile device market. Your site will look razor sharp on any device. Shop page is one of the most important elements in your web store. We understand that should give you maximum flexibility in desired layout. Header Builder give you the power to create your desired header with drag & drop features. No longer worry about footer design restrictions. In this theme, you have all the options to design a page so you can create and design your preferred footer in visual mode. Convert your normal variable attribute dropdown select to nicely looking color or images swatches. Shopping made easy with the integrated canvas cart, manage nd tweak with the cart products only with a click. Search products instantly with our optimized AJAX search function. The implemented AJAX technology allows filtering and sorting products without page reloading. There is no limitation. Complicated layouts, menu, background and anything that you need are ready for you to design your desired mega menus. We all know that a slow site is a bad one no mater hover pretty it looks. Thay’s why we paid extra attention to do everything is necessary that your site runs faster and smoother than ever. The theme live demo scores 95% on the page speed grade. The theme has variety of professional hover animation effects. Your imagination is your only limit. Go ahead and give theme a try! Dynamic checkout buttons are an alternative to the add to cart button for single products. Withy dynamic checkout buttons, customers can skip the cart and go directly to the checkout.